www.bloomingdales.com – Bloomingdale’s Holiday Sweepstakes. The upscale chain of quality clothes and accessories department stores is sponsoring this awesome Holiday sweepstakes. Imagine $2,000 dollars that you could spend on buying Bloomingdale’s nice fashion design clothes or accessories. Imagine your wardrobe filled with beautiful design dresses to start the new year. Well this what Bloomingdale’s new sweepstakes marketing promotion could offer you this Holiday. Visit today bloomingdales.com Sweepstakes website and your name could come up of a random drawing that will be held on or about January 6, 2013 by Sponsor representative of Bloomingdale company. 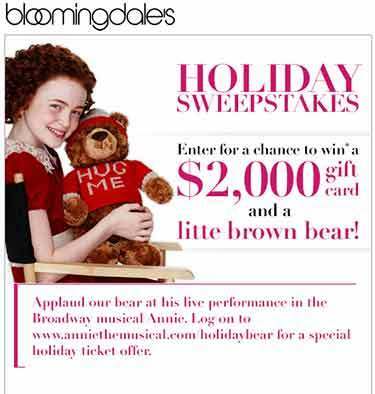 Enter and you can win a $2,000 Bloomingdale’s gift card and a Bloomingdale’s Holiday Bear from Bloomingdale’s Holiday Sweepstakes. Follow the on-screen instructions at www.bloomingdales.com Sweepstakes to complete and submit the “Official Electronic Entry Form,” which will be available at the Sweepstakes Site during the Sweepstakes Period. PRIZE DESCRIPTION:One (1) winner will be chosen to receive the following prize package: One (1) $2,000 Bloomingdale’s Gift Card One (1) Bloomingdale’s Holiday Bear, $16 Gift Card valid for use at any Bloomingdale’s store or on bloomingdales.com. Prize not transferable or exchangeable and cannot be redeemed for cash or used to pay account balance. Aggregate retail value of prize: $2,016. Prize is non – transferable and no cash equivalent or substitution by winner is allowed. Sponsor reserves the right to substitute prize for one of equal or greater value. Sweepstakes open to legal residents of the 50 United States and District of Columbia, who are least eighteen (18) years of age as of date of entry. Applaud their bear at his live performance in the Broadway musical Annie. Log on to www.anniethemusical.com/holidaybear for a special holiday ticket offer. It would be Wonderful to win this sweepstakes. I would give the bear to Titus my two year old grandson. and then I would share the gift card with friends and family.